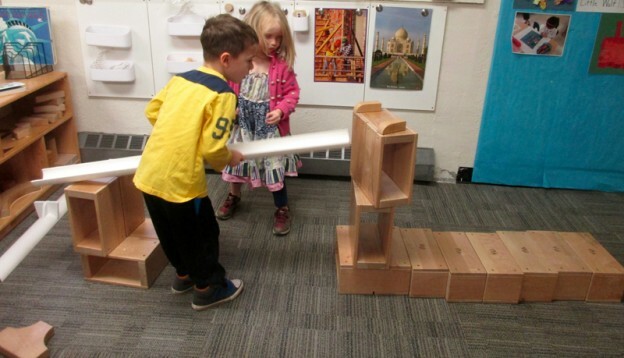 Children in every classroom have been deeply engaged in the physical sciences and engineering through use of ramps. We’ve found that large groups of children have designed, solved problems and worked together for extended periods of time every day when ramps are available. For some, ramps are spontaneously designed as part of a block construction or city scene. This exploratory stage is an important one, and gives teachers ideas about the kinds of questions or problems we might pose to children as they play. First by joining play, describing what we see, and posing informal challenges, and then later by proposing specific problems for children to consider, we encourage children to form hypothesis, make predictions, observe, and reflect, and connect experiences to deepen knowledge. To support this play, we connect ramp play to other materials which with objects are in motion – for example, marble painting, water play, using scarves, small parachutes or streamers in the wind, etc. And we connect our discussions of ramps to some good reasons to use them in design. For example, our school ramp makes it possible for someone in a wheelchair to access our space, and in block play a good ramp system can assure that our dolls that use wheelchairs have access too. And if children are designing a harbor system we have to find a way for boats to move off the trucks or cars that carry them so that they can access the water. Right now there are extensive investigations of ramp systems and velocity among some of our older students, who spend long periods of time, often in teams of 2, experimenting and discovering. The interest in ramps for these children began when children took materials from a sink and float experiment and began using them in different ways. They used a Styrofoam container and a marble to roll the marble back and forth and were very interested in how the marble moved. They noticed that they could rock the Styrofoam to make the marble move slower or faster. When ramps were introduced, children were encouraged to make predictions and hypothesis about how the marbles would move down the ramps. They have been working on ways to change the angles of the ramps they use in their designs to see what would happen. A next step was to create traps for the marbles to get caught in. We know that this rich play is only beginning, and will take different forms over the course of our year together. We’ll continue to observe, ask questions, pose challenges for the children, and offer a wide range of materials, including materials with which to create new ramp systems, so that this deep engagement in understanding how things work continues.